LUTSK, Ukraine -- Poland has temporarily shut down its consulates in Ukraine after a grenade attack damaged one of them in the border town of Lutsk early on March 29. 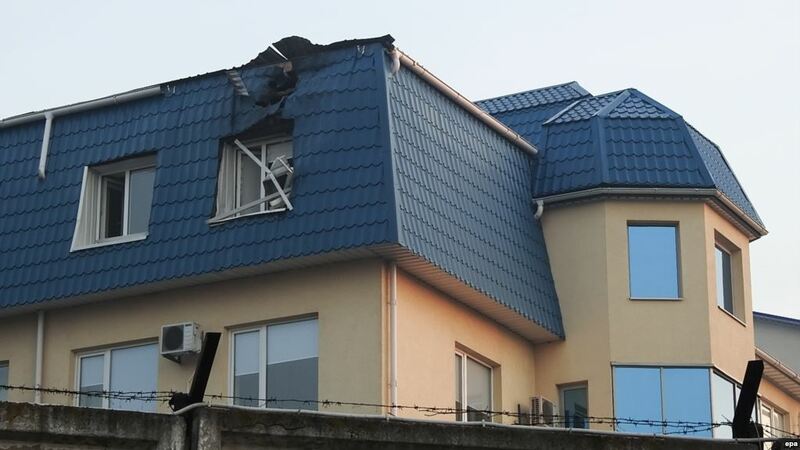 The roof of the Polish Consulate in Lutsk was damaged overnight by an unidentified large-caliber weapon on March 29. Both Ukrainian President Petro Poroshenko and Polish President Andrzej Duda condemned the attack, in which no one was injured. The Ukrainian security forces issued a statement saying the incident was one of a series of "provocations against the Republic of Poland" that "are of benefit only to one party -- the Russian Federation." A Poroshenko spokesman claimed on social media that Russian provocateurs had tried to orchestrate a prank phone call with Poroshenko by claiming to be Duda. In an earlier phone call between the two presidents, Poroshenko invited Poland to participate in the investigation of the Lutsk attack. Relations between Poland and Ukraine have been tested in recent months by several incidents of vandalism of World War II monuments that officials from both countries have also blamed on Russia. Despite their historic enmities, Poland has been a staunch supporter of Ukraine's closer relations with the European Union and a leading advocate of sanctions against Russia for its 2014 annexation of the Ukrainian region of Crimea.